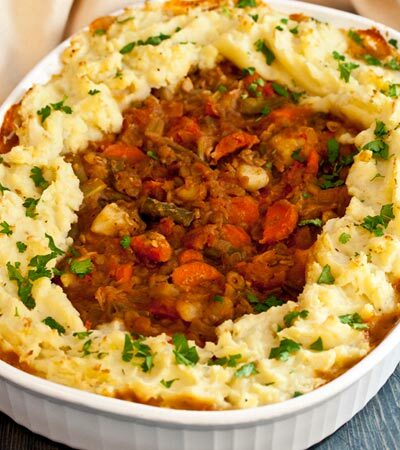 This vegan version of a traditional Shepherd's Pie uses lentils instead of meat and is flavored with pinches of cumin, allspice and thyme. What really gives this dish it's beefy and full flavor is the caramelized onions which are slowly caramelized for 45 minutes. 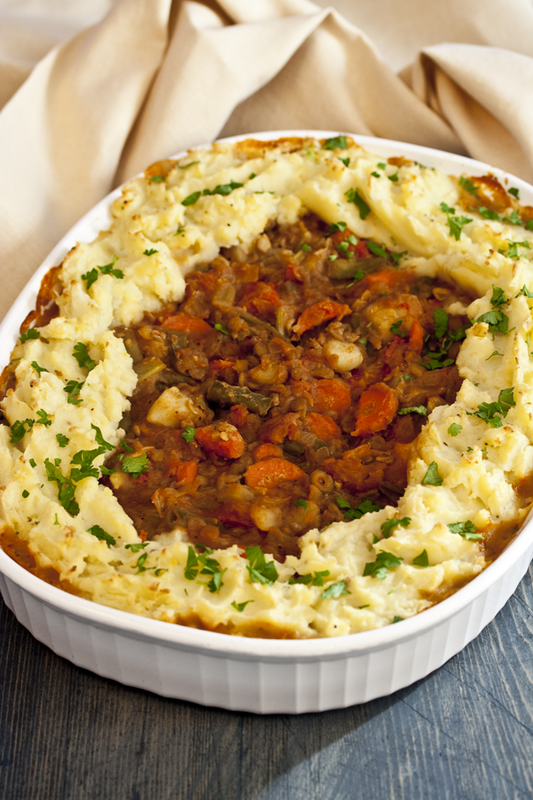 Chock-full of potatoes, it's a very satisfying and comforting meal. Want to know what others thought about this recipe? Would you like to comment on this recipe? Go to the Vegan Shepherd's Pie blog entry. Place onion into a large heavy skillet with olive oil and caramelize on in-between medium to low heat for 45 minutes. Yes, I said 45 minutes. The onions are slowly cooked for a long time to develop a deep flavor. Stir them and check them occasionally to make sure they're not burning. While that is cooking, take the lentils and water and place into a large heavy saucepan, cover and cook on medium heat for about 20 minutes. After 20 minutes add carrots, celery, green beans, cumin, allspice, thyme, garlic, liquid smoke and soy sauce to the saucepan. Cover again and cook 25 to 30 minutes, or until carrots are tender. Check them 20 minutes in to make sure there is enough water for the lentils and stir. After the carrots become tender, if there is any remaining liquid, drain it out of the pot. As that cooks, peel potatoes and cut potatoes into 1 inch cubes. Place potatoes in a separate large heavy saucepan. Cover with water and bring to a boil and turn heat down to medium. Let them cook about 20 minutes or fork tender. After cooked, drain them. Add to the pot with the lentils, 1 & 1/2 cups of the cooked potatoes, tomatoes, lemon pepper, sugar, Tabasco sauce, salt and the caramelized onions from the skillet. Mix carefully so you don't break up the potatoes. Place into a 2.5 liter casserole dish sprayed with a little bit of olive oil. To make the cream potatoes that go around the edges, in a coffee cup add the vinegar and soy milk and mix together and let clabber. Add this to the remaining potatoes with the nutritional yeast flakes, salt, lemon pepper and vegan butter and cream together. Spoon it around the casserole dish. Place into the oven and bake 20 minutes.